Aircraft emissions play a role in climate change and air quality, which result in incremental adverse health impacts. Thus, understanding how different fuel components influence pollutant emissions as well as the resulting impacts on human health and the environment is significant for researchers and policymakers. A typical Jet-A fuel composition breakdown is shown below. 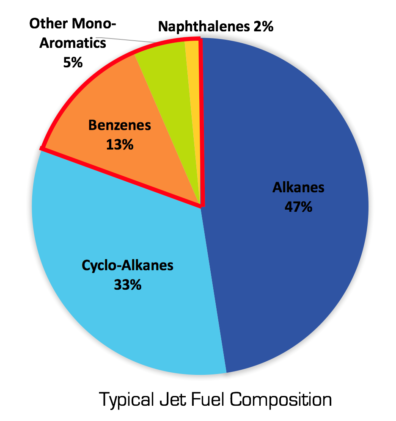 Aromatic components (including benzenes, naphthalenes, and other mono-aromatics), while important for engine operation, have been shown to contribute considerably to non-volatile particulate matter emissions (i.e. soot). The public health, global climate change, and economic impacts of reductions and/or removal of naphthalenes in the U.S. While removal of naphthalene from jet fuel is not practiced in refineries today, removal of various aromatic compounds from petroleum streams is a common process in the petro-chemical industry. As a result, Hydro-treating, Extractive Distillation, and Absorption, common chemical processes used in the industry today, have been chosen as candidates for naphthalene removal, and will be analyzed further. Each process will be modeled to determine critical design parameters, utility needs, and fixed capital investment. By gathering economic and historical utilities data, our U.S. centric cost model will ultimately allow for estimation of the cost to U.S. society to remove naphthalenes from jet fuel. Via a cost-benefit analysis, we will ultimately determine if the benefits to the climate and air quality outweigh theses costs. Recent analysis of emissions campaigns including NASA’s APEX, AAFEX, and ACCESS, and the Swiss Federal Office of Civil Aviation’s A-PRIDE have shown that naphthalenes produce a disproportionate amount of soot compared to their mono-aromatic and saturated counterparts. While soot formation and production is a very active research field, the composition effects of petroleum derived fuels on soot emissions are still poorly understood. Using the Reaction Mechanism Generator (http://rmg.mit.edu) code to develop a reaction mechanism with realistic soot precursor reaction pathways for paraffins, aromatics, and naphthalenes. Using Cantera (http://www.cantera.org) to model the reaction mechanism in a diffusion flame to compute poly-aromatic hydrocarbon formation rates. Correlating the results to existing analysis of soot emissions from aircraft engines to develop scaling relations between poly-aromatic hydrocarbon formation rates computed by the model for a particular fuel composition and the expected soot emissions of different engines. Ultimately, removal of naphthalene from jet fuel will lead to reductions in aviation’s impact on climate and air quality. While reducing soot has a large positive impact on both, the reduction of sulfates, contrail effects, and changes in refinery emissions must also be considered. To assess the effects on the climate, we are using the APMT-Impacts Climate model, which is a policy-oriented rapid assessment tool that provides probabilistic estimates of climate impacts, including the monetization of climate damages. To assess the effects on air quality, we are using the GEOS-Chem adjoint model, which allows for estimation of the premature mortalities prevented by reduction of aviation soot. In order to estimate the overall benefits and costs of a potential naphthalene removal policy, we will combine the resulting monetized estimates of refinery costs, climate impacts, and air quality impacts in a cost-benefit analysis. 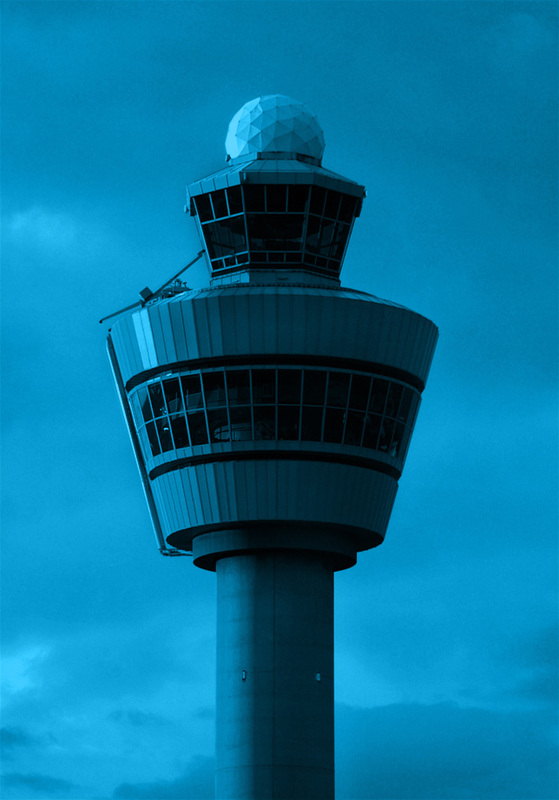 The result of this analysis will determine the extent to which naphthalene removal represents an appropriate policy to reduce aviation’s impact on the environment. Stochastic model for refinery cost estimation for individual refinery fuel premiums and the cost and net present value to U.S. society at large. Comprehensive cost-benefit analysis with probabilistic estimation of benefits of naphthalene removal to society.